A playing field with small figurines, little houses, and all sorts of other props to represent an imaginary world can be a great visual aide when playing a tabletop game. Unfortunately buying them isn't always a viable option, as miniatures can be really expensive. It's really easy to create some on your own though, and for just a fraction of the costs too. Natural elements are usually very easy, as there's a lot of leeway in terms of looks. In this guide I'll show you how to create trees out of toothpicks, corks, and some bush material used in all sorts of miniature building. The great thing about these is that they are incredibly customizable. Trees, bushes, shrubs, anything goes. It's in your hands. Parental guidance: Use of scissors and super glue. Could use other glues instead, but it increases the duration of the crafting. Time: 30-60 minutes per tree. 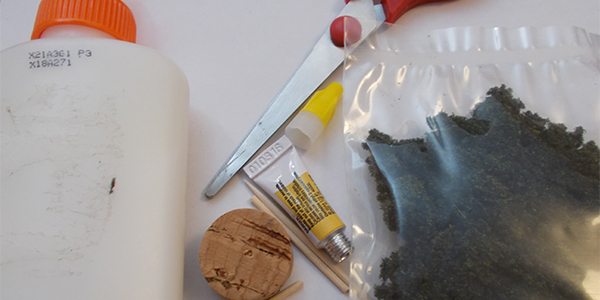 Materials: Cork(s), toothpicks, (super) glue, scissors or cutters, miniature shrubs. Optional materials: Anything else you wish to add to or use for your trees. The shrubs could be replaced with lots of different materials for example. First, gather all the materials you need, and make sure you have a clean work space. Some old clothes would be wise too, just in case you happen to spill some glue. Once you've got your workspace ready, grab a couple of toothpicks, and cut them in half. The cuts don't have to be symmetrical, in fact, it's better if they're not. Then grab another toothpick, this'll be the base of the tree. Glue one of the cut pieces to this base at an angle. This'll be the first main branch. Repeat this step at least 3 more times, so you'll have 4 branches, one in each direction. If you're having trouble adding branches, try balancing the toothpick on something. Clothing pins can help a lot too, but make sure you don't accidentally glue them to your trees. Once you have your tree with the first 4 branches, you can either add more main branches, or continue with the smaller ones. For the smaller ones, cut up more toothpicks into smaller pieces than before, and glue them to the main branches at different angles. You'll eventually end up with a bare looking tree, perfect for an autumn or winter setting for example. Simply stick it in a cork base, and you're almost done. 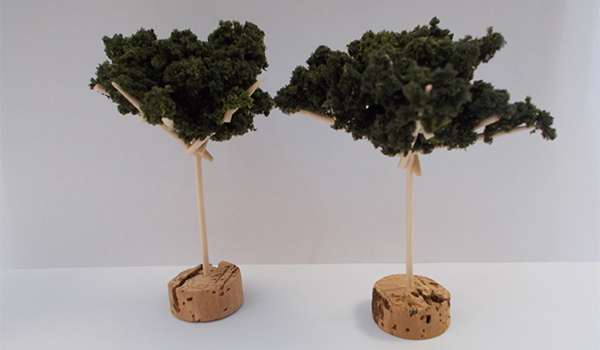 If this is all you need, you could still spice things up by painting the toothpicks to mimic different kinds of trees. You could also play around with the shape of the tree, perhaps even snap it in half to represent a fallen tree. If you do want foliage, simply put a few drops of glue on a branch, then press some of the bush material on it. Let it dry, repeat for the other branches, perhaps add a few more pieces on top of other bush pieces to fluff up the tree, and you're done. Simple enough, right? It's pretty easy to create all sorts of variations, ranging from all sorts of tree types to bushes, and from small shrubs to fantastical trees. A bush is basically the same as a tree, just with its base cut of where the leaves begin. Shrubs can be as simple as a single piece of toothpick covered in leaves, and so on. If you're trying to recreate specific kinds of trees, try to first envision the overall structure of the tree without the leaves. For this it helps to look at pictures of those trees in autumn and winter, assuming they lose their leaves of course. If they don't, there may still be pictures of dead versions of these trees, which generally means they'll have lost their leaves as well. A lot can be fixed or made to be better looking after the initial structural phase. Adding more small branches or covering everything in foliage often vastly improves the otherwise barren look, for example. If all else fails, it can always pay to experiment. If something doesn't work, simply break off a piece, reuse it for something else, and continue from there.